(1.8mb) A PDF file by David Pelham (updated 10 October 2018). by John Lawson. This is a very useful cross reference on many Y/YT and YB parts and lists other cars that had the same parts. A full back catalogue of Newsletters scanned from Safety Fast, from the first in 1992, to date. A miscellany of resources and articles to help you decide on how to buy and what to look for. (241kb) A PDF by Tony Vernall. for creating a desktop shortcut to the website. You may need both files. (310kb) A PDF file with an introduction by Neil Cairns of guarantee plates, chassis numbers and engine numbers, where this information is known. (4.5mb including colour pictures) by Neil Cairns. Details on the luggage straps that were available as a period optional extra. Historical research on individual cars by their owners. Details of models of the MG Y Type. Historical Timeline of Y history events and contemporary world news. Terry Ciantar's original tool kit Photographs by Terry Ciantar. A new Hint and Tip has been sent in by Dave DuBois on overcoming float fork drop in the carburettor float chambers and avoiding the subsequent overflow. Some welcome and long awaited news for YA and YT owners is released this month by the MG Octagon Car Club, in that one of their members has solved the conundrum of the YA/YT half shaft availability through re-manufacture! Please see the following extract from the August 2006 Bulletin (Journal of the MG Octagon Car Club). Finally, due to the initiative of one of our members, we can now offer new YA[/YT] half shafts. The member went to a friend who has a small business, part of which is the manufacture of half shafts for competition cars. As all YA[/YT] owners know the current half shaft is forged with a head on from which the flange is turned. To make one from solid EN material (not from a forging) would be expensive as the bar alone, would be about £100 per item and the machining of this bar would also be expensive and consider the waste. The member finally decides that it would be better to make it in two parts, i.e. similar to the MMM and TA/TB/TC cars. This would be beneficial as if in many years time the half shaft needed replacing only the shaft section would need to be replaced. 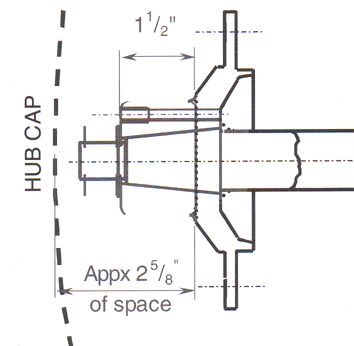 For this scheme to be possible a thicker hub would be needed to provide the rigidity on the outboard end. Measuring the available space behind the chrome wheel disc shows that there is 2 5/8" of space available and of a diameter a little less than the hole in the wheel centre, more than enough. Sketch shows the modified design. Initially it was proposed that a spline on the outer end should be similar to that on the inner end but it was finally decided that the best option (following discussions and viewing half shafts manufactured for MG&apos;s with more power output than the YA[/YT]) would be a long shallow taper. These have now been manufactured and although they are not cheap, they are at least now available so that the YA[/YT] can once again take to the roads knowing that a broken half shaft will not mean a year or two&apos;s hunt for another. *Owing to insurance restrictions, the MG Octagon Car Club is unable to ship to the USA and Canada. For more details. Please contact Harry Crutchley at the MG Octagon Car Club on +44 (0)1889 574666 or fax +44 (0)1889 574555 or email Harry from here. Today please welcome Radampola Premarante and YT 6756 to Ys on Parade. YT 6756 is our 89th YT added to the site which has taken YTs into double digits with 10.06% of total currently known production and is the second car to be added to Ys on Parade from Sri Lanka. Mid August already! The mid-month Reprinted Article is another one from July 1996 - this time from Enjoying MG magazine on Special MG Y saloons. Although we all know that all MG Y saloons and tourers are special, the article is nonetheless interesting to read. Andrew Coulson has sent in a report on this year's Ripon Old Car Show where they had 9 Ys! Andrew Adamson also sent in some photographs too. Please welcome Bill Harrison with YB 1283 to Ys on Parade. Bill's car brings the number of YBs on the website from the UK equal to the number of YAs at 56 and is the 325th car! Welcome Bill. Just a reminder that the MG Car Club Y Type Register (UK) is planning a weekend long celebration of the 60th Anniversary of the Birth of the Y for next year. UK (and indeed any owners near or far) are reminded to 'rope off' the weekend of 12 - 13 May 2007 for this event. More details to come on this soon ... so watch out! Douglas Lesch is now the new owner of YT 3430, so please welcome him to Ys on Parade. This month gets of to an interesting shot from some friends of Bert Keuren's recent holiday in Cuba for Picture of the Month. The Reprinted Article comes our delve into the 1990s archive and is from Classic and Sportscar, July 1996, with Jon Pressnell explaining why the MG Y-Type could be the perfect classic saloon. The article also has an amusing photograph at the end of Register Committee Members Jack Murray and David Hague. Please also welcome Peter Sharp, the new owner of Y 6041. Paul Gresser has also updated his entry for YB 1446 with a new photograph and modified text. Click on the hyperlinks below to see complete archive pages of the news from a previous month.